The European Union (EU) is a legal entity, and is defined in international law by treaties and binding commitments. Its geographical borders are defined (the 28 member states), and the criteria for membership are also defined: in general terms (the famous Article 2, on European values), and specifically in accession treaties. That is the EU. ‘Europe’, on the other hand, is another kettle of fish altogether. For a long time it was much bigger than the EU, and it still is (Iceland, Switzerland and Norway are not EU members, to say nothing of East European states like Russia and Ukraine).‘Europe’ is a vague and ill-defined construction, invented by geographers and historians in Antiquity (Hecataeus, Herodotus) to divide the known world into three parts (Asia, Africa, Europe) as geographical labels on maps. Since then definitions of Europe have continually changed, and further continents have been added to the European view of the world. Those ‘new’ parts of the world were invariably defined by Europeans – the politicians and the mapmakers – with the purpose of arranging barriers between ‘us’ and ‘them’, whether such boundaries were physical, political or cultural. Waterways were the first obvious markers: the Greeks thought of the known world as a single, roughly circular landmass surrounded by an external ocean. Internally, the Mediterranean separated Europe from Africa, and the Nile (or the Red Sea) split Africa from Asia. The border between Europe and Asia started from the Aegean Sea, ran up the Hellespont, into the Sea of Marmora, through the Bosporus into the Black Sea, past the Crimea through the Straits of Kerch, into the Sea of Azov and finally northwards and upstream on the River Don, as far as Greek colonies extended. However, there was little cultural content attributed to these ‘parts of the world’. They appear simply to have been convenient labels to place on various sections of the world map, and Herodotus was famously at a loss to explain what the labels meant, beyond being named after minor goddesses. There are some oblique references in the Ancients’ texts to the ‘qualities’ of Asians as opposed to those of ‘Europeans’, but they do not amount to very much and are anything but coherent. The Greeks had as many colonies in Asia as they did on the western side of that watery border, and the Romans controlled vast swathes of all three continents. Not even Christianity was claimed as a European characteristic by the Ancients: Christ was not a European, and he never travelled to Europe. 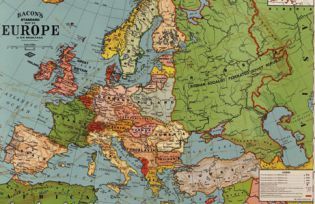 These geographical notions changed little in the Middle Ages, but in religious terms ‘Europe’ became an important concept for the first time: Latin Christianity became a defining cultural feature of Europe. The reach of the Roman Church, and the Holy Roman Emperors (Charlemagne and successors) pitted a geographically rather fuzzy notion of their Christian Europe against Eastern Byzantine Christianity, and especially against Islam to the south. And it was centuries before great tracts of northern and eastern Europe were included in this new spiritual Europe-awareness. Only in the Renaissance period did ‘Christendom’ give way to a notion of European civilization, which extended approximately to our current geographical notions of the continent. But still that border with Asia was constantly on the move. Increasing penetration into the eastern reaches by West European diplomats and especially merchants caused their cartographers to push outwards the borders drawn on maps and in men’s minds to show where Asia began, and the direction of boundary creep from about 1400 to 1800 was usually westward. The activities of the Russians themselves also had a considerable effect: Ivan the Terrible caused the border on European maps to lurch back in a westerly direction for a time, while in the eighteenth century the Europeanization programmes of Peter and Catherine the Great – from their new capital of St Petersburg – saw the Russian elite swivel its principal gaze around to engage with Europe. Romanov Russia was a full member of Europe in the nineteenth century, present at the defeat of Napoleon, the conference table, the ballet and concert halls, the literary salons, and in every other location of politics and high culture, until the 1917 Revolution turned the border back again. In the south the undisputed geographical border dividing Asia from Europe is the Bosporus, a waterway running right through a city (Istanbul), a country (Turkey), and for centuries an empire (the Ottoman). Is Turkey a ‘natural’ part of Europe? Some of it (east of the Bosporus) probably is, and the Ottoman Empire in the seventeenth and eighteenth centuries was certainly a full player in the European international relations arena. In the nineteenth century, in somewhat weakened form, as the ‘Sick Man of Europe’, the Sultan was still an essential member of the informal network of summit diplomacy (the ‘Congress System’) which ran Europe and contained its wars from 1815 to 1914. The Ottoman majority religion of Islam did not prevent that status, and neither did the longstanding fundamental differences between Roman Catholic, Eastern Orthodox and Protestant Christianity provide grounds for exclusion from Europe. So the geographical borders of ‘Europe’ provide no unshakeable precedents for the extent of the EU. Many of the other possible criteria for such borders are equally unreliable. Even the proclaimed European values of Article 2 have changed and evolved over the years. Such allegedly ‘European’ virtues began to be recognized at the time of the Renaissance, but were increased subsequently, especially in the Enlightenment and in the twentieth century. Human rights were claimed as a European set of values after the Second World War, whereas very little had been heard about them before. As Hungarian Prime Minister Victor Orbán remarked recently, values can be changed, if a majority votes that way. So not even European ethics are stable. Can gender help us? Europe has consistently been visually personified as a woman in paintings, sculptures, prints and maps over the past 500 years, but then so have the other continents. Robert Kagan told us that ‘Americans are from Mars and Europeans are from Venus’, and there may have been, at times, something behind such a brash generalization about soft and hard power. Gender relations might contribute to some kind of a moral boundary: the West, and Europe in particular, thinks that it ‘does’ gender correctly – emancipation, equal opportunities, gay rights, etc. In the early twentieth century writers like C.S. Lewis and Denis de Rougemont were convinced that European traditions of romantic love dating back to the Middle Ages made Europe unique. The Eurocentric idea that Europe (and later the West) is the only part of the world with a worthy set of gender norms is remarkably persistent, but is undermined by the obvious gaping flaws in the West’s treatment of women, and no doubt of sexuality in general. So geography, history, ideological values: none of these provides a reliable set of borders for Europe. Any attempts to define Europe, the EU or its borders in terms of race and ethnicity, or genetics, or environment-induced permanent characteristics (Blut und Boden, for example) all run into hopeless contradictions and quandaries: it is simply not possible to define Europe in those terms. This leaves us with geopolitics, or changing structures of legal jurisdiction or forcibly applied control, imposed hegemony or willing association. Again, the very real and palpable structures of the Roman Empire, despite their undeniable legacy in Europe, were so geographically mismatched with ‘Europe’ as to be of little help. The efforts of Charlemagne, the Habsburg Charles V, and even the Bourbon Louis XIV were perhaps European in the scale of their ambitions, but largely ineffective in exerting hegemony over the entire continent. Only two regimes came close to it before 1950: those of Napoleon and Hitler. Both were short-lived, but both had profound effects, the most significant of which was an overwhelming negative reaction and sentiment of ‘never again’! There really is no reliable historical set of precedents to guide us about the borders of Europe, until we come to the EU and its direct predecessors in the second half of the twentieth century. Various schemes and ideas about how to arrange Europe integration and even unity have emerged since the Middle Ages, especially in the eighteenth and twentieth centuries: Immanuel Kant and Richard Coudenhove Kalergi are only two of the more famous names in the flood of blueprints for Europe which have rolled off the press, with detailed plans for parliaments and arbitration mechanisms. Some schemes have been willing to include ‘non-European’ countries like Turkey or China, or even the whole world. Economic integration has often been seen as a useful starting point; the common denominator of stated intentions was always to reduce the risk of war amongst those consistently belligerent parties, the states of Europe. Our current EU and its predecessors, along with the Council of Europe, are the only structures to have made concrete progress in that direction, and have steadily expanded their external borders since their foundation after World War II. When the external borders surrounded six, nine or even twelve wealthy countries mainly in north-western Europe, then a degree of political, economic and even socio-cultural convergence was possible in a way that was made much harder with an expansion to 28 member states. So, Europe and the EU have no natural borders. Europe is a construct, Europe is what we make it, and it has changed constantly over the centuries. Michael Wintle studied at Cambridge, Ghent and Hull Universities, and since 2002 has held the chair of Modern European History at the University of Amsterdam, where he head of the department of European Studies. Prior to 2002, he was Professor of European History at the University of Hull, UK, where he had taught since 1980. He has published widely on Dutch and European history, including the following recent books: The Image of Europe (Cambridge UP, 2009); European Identity and the Second World War (ed. with M. Spiering, London, Palgrave 2011); and The Historical Imagination in Nineteenth-Century Britain and the Low Countries (ed. with H. Dunthorne, London, Brill 2013). He is currently working on Eurocentrism, and on Europe’s resilient capacity for reinventing itself in a positive light.